We’d love your help. 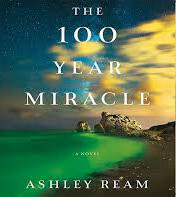 Let us know what’s wrong with this preview of The 100 Year Miracle by Ashley Ream. Once a century, for only six days, the bay around a small Washington island glows like a water-bound aurora. Dr. Rachel Bell, a scientist studying the 100-Year Miracle and the tiny sea creatures that create it, knows a secret about the phenomenon that inspired the region’s myths and folklore: the rare green water may contain a power that could save Rachel's own life (and c Once a century, for only six days, the bay around a small Washington island glows like a water-bound aurora. Dr. Rachel Bell, a scientist studying the 100-Year Miracle and the tiny sea creatures that create it, knows a secret about the phenomenon that inspired the region’s myths and folklore: the rare green water may contain a power that could save Rachel's own life (and change the world). When Rachel connects with Harry and Tilda, a divorced couple cohabiting once again as Harry enters the last stages of a debilitating disease, Harry is pulled into Rachel's obsession and hope as they both grasp at this once-in-a-lifetime chance to save themselves. To ask other readers questions about The 100 Year Miracle, please sign up. The stunning cover first attracted me. The idea of tiny sea creatures that once every hundred years for six days make the water glow phosphorescent green was fascinating. It is understandable that scientists would want to study them. Dr Rachel Bell is one of the scientific team. To her though there is more involved than just studying the creatures. She has heard many mythical stories about these tiny creatures and hopes they will provide answers to her own painful secret. The other main characte The stunning cover first attracted me. The idea of tiny sea creatures that once every hundred years for six days make the water glow phosphorescent green was fascinating. It is understandable that scientists would want to study them. Dr Rachel Bell is one of the scientific team. To her though there is more involved than just studying the creatures. She has heard many mythical stories about these tiny creatures and hopes they will provide answers to her own painful secret. The other main characters are Harry who is dying and his ex-wife Tilda who has returned to the island to look after him in the last stages of a debilitating diseases. If you are looking for a feel-good book, keep looking. Although I found the overall story somewhat compelling, I developed no warm feelings for any of the characters. The ending of the book was irritating and aggravating on many levels and I was actually happy to have it over with. Gripping, atmospheric...an almost exhausting (in a good way) read. These characters and this story will stay with me for a long time. It is, primarily, a story of hubris. The 100 Year Miracle begins with Dr. Rachel Bell, a member of a small research team who have set out to study the Artemia lucis, a small sea creature that glows a bright green during it’s mating period, which lasts for five days every 100 years, only around an island off the coast of Washington. Dr. Bell, however, betrays her research team to conduct a study of her own – investigating the mythical painkilling properties of these sea creatures in order to cure It is, primarily, a story of hubris. The 100 Year Miracle begins with Dr. Rachel Bell, a member of a small research team who have set out to study the Artemia lucis, a small sea creature that glows a bright green during it’s mating period, which lasts for five days every 100 years, only around an island off the coast of Washington. Dr. Bell, however, betrays her research team to conduct a study of her own – investigating the mythical painkilling properties of these sea creatures in order to cure her chronic pain from a childhood accident. The story has a very mystical quality – because of the nature of these sea creatures that anchor the story, the tone is set that we are witness to something strange and delicate, something otherworldly and mythical. And indeed, Dr. Bell’s research about these creatures involves Native American folklore surrounding them, which is what sets her on her quest. According to the stories she’s found, the people native to the island used the Artemia lucis as both painkiller and hallucinogen, and as a way to access the spirit road. It is clear that these creatures are not to be disturbed, however, Rachel’s quest leads her down a destructive path. When she meets Harry, a resident of the island who is also suffering from chronic pain, she begins to unlock the powers of the Artemia lucis despite the negative effects it begins to have on her and those around her. However, Rachel’s obsession is, on one level, understandable. It’s a very human thing to want the pain to stop, especially if it’s a pain that’s been ailing you for the majority of your life. It’s very human to get greedy with it, to become to single-minded that we fail to see the chaos that is happening on the other side of our blinders. I’m sure that a lot of people with chronic illnesses – especially illnesses that effect who we are as people and take away parts of us that we value – would jump at the chance to find a painkiller that would make it stop, even if that painkiller comes with some pretty intense side effects. It’s a matter of the good outweighing the bad, or rather, it’s a matter of priority. And maybe Rachel’s ego gets in the way a bit. Maybe she goes overboard, and certainly there are ethical issues involved with her research and the disturbing of the Artemia lucis’ mating season. But would any of us be any different, given the chance? It is so easy to access those darker parts of humanity – the parts that allow us want to play God, to be selfish to the point of destruction. It’s a thin line between ground-breaking discovery and dangerous obsession. As in her debut novel, Losing Clementine, the author employs an almost flippant approach to her prose and to her character's inner conversations. In the first novel, this approach played brilliantly into the main character's own disregard for convention and paved the reader's way on a wholly enjoyable read. In this work, however, the same playfulness serves to dampen any compelling tension as it begins to form. Loosely defined characters arrive, mill about for a while and are then discarded easily. It almost feels as though Ream never really committed herself to fully developing these characters. They come off as wooden and two-dimensional. John, the aboriginal who serves as the "moral compass" immediately becomes arch enemy to Rachel--the maddened scientist with a blistered past (no pun intended) and a deeply personal interest in her work. Department head Hooper is a weather-beaten field work veteran whose devotion to Science has taken a heavy toll on his health, his personal life, and his finances. Tilda is the recently displaced over-achieving ex wife who answers her dying ex-husbands call to be his care-giver. Of course, he is a tempermental artist who, though he reached out to Tilda for help, regularly resents her interference with his decsions. I can't escape the notion that I've met all of these characters in B movies. The device of Tilda's adventure at sea seemed mechanical and superfluous to the story. Tip's inclusion in the story seems to serve no purpose other than a thinly developed justification for that very sea adventure. And I am left wondering why we even met Juno. I cringe to write this review only because I wanted so much to love this book. I looked forward to reading it since finishing the author's debut novel 2 years (?) ago. In fairness, perhaps my anticipation built unscalable expectations. I suppose I was expecting something with more depth than one might find in a light summer read. On those terms, this book is very good. It moves quickly. The reader is never mired into pages of inner dialog or Dickensian descriptions of hall sconces. For that, I most grateful. And I love the many facets of the premise of the luminescent anthropods who mate every 100 years. I can not say that I did not, at least, LIKE this book. In my mind, I'm putting this work into the "very talented artist exploring the craft" bin. As such, I will patiently wait for her next offering. It’s been a long time since I was so caught up in a book that I forgot about (and burned) my dinner. I found The 100 Year Miracle riveting, inspiring, heart-breaking and evocative. I became a fan of Ream after reading her first novel, Losing Clementine. Ream’s writing is both dynamic in prose and narrative. She creates so many well-drawn characters. Even when someone behaves badly in The 100 Year Miracle, you can’t help but feel their pain and put yourself where they are. As someone who copes wi It’s been a long time since I was so caught up in a book that I forgot about (and burned) my dinner. I found The 100 Year Miracle riveting, inspiring, heart-breaking and evocative. I became a fan of Ream after reading her first novel, Losing Clementine. Ream’s writing is both dynamic in prose and narrative. She creates so many well-drawn characters. Even when someone behaves badly in The 100 Year Miracle, you can’t help but feel their pain and put yourself where they are. As someone who copes with a progressive neurological disease, I suppose I was especially touched by the grief and loss that goes with having one; and the suffering of family around you. The world-building of the fictional “100 year miracle” is atmospheric and breath-taking, it vividly pops from the pages and I truly enjoyed both the scientific research and legends that surrounded it. This a powerhouse of a story – it makes you feel, think, consider and be grateful. This book has a fascinating premise - a microorganism living off the coast of an island in the Puget Sound becomes luminescent for six days every 100 years. Scientist flock to the island to discover the properties of this organism. A young scientist with debilitating chronic pain has read in Indian Lore that people who drink the water with this organism become pain free. She is determined to discover if this works and if this will help her personally. The plot becomes tangled as she gets involved This book has a fascinating premise - a microorganism living off the coast of an island in the Puget Sound becomes luminescent for six days every 100 years. Scientist flock to the island to discover the properties of this organism. A young scientist with debilitating chronic pain has read in Indian Lore that people who drink the water with this organism become pain free. She is determined to discover if this works and if this will help her personally. The plot becomes tangled as she gets involved with an elderly man with a debilitating disease. His ex-wife has come in to aide him in end of life care. This plot gives me more than I wanted in terms of strange relationships and rude behavior and the author leaves me hanging without as much scientific information about the organisms as I would have liked. This was one of those odd books where I never really liked any of the people in the story. I didn't care what happened to any of them so the story kind of got lost for me. Even though the "miracle" is only made up in the author's mind, I thought she did a good job of making it appear realistic. I did like that part of the story. I just wish she'd given her people some more likeable qualities. Even if we just had one or two likeable people, the story would have been better. It was a decent story a This was one of those odd books where I never really liked any of the people in the story. I didn't care what happened to any of them so the story kind of got lost for me. Even though the "miracle" is only made up in the author's mind, I thought she did a good job of making it appear realistic. I did like that part of the story. I just wish she'd given her people some more likeable qualities. Even if we just had one or two likeable people, the story would have been better. Every hundred years, the Artemia lucis - tiny, eight millimeter long arthropods - come alive. They hatch from ancient eggs and spend the next six days mating, or trying to, before laying the next generation of eggs and dying. During the nighttime, they emit a neon green glow, turning the whole of Olloo’et Bay - their only known habitat - into a wondrous light show. The phenomenon is known as The 100 Year Miracle. Yet, despite the colloquialism, few people are aware of the insects' more miraculous properties. The (fictional) Olloo’et - southern Northwest Coast peoples who resided on (the fictional) Olloo’et Island until they were forcibly relocated in the 1920s - believed the (fictional) Artemia lucis sacred. During their infrequent periods of activity, the Olloo’et men partook in a ceremony: accompanied by a shaman and tribal leader, the men spent six days and nights drinking the bay's water (complete with insects), which had hallucinogenic effects. The men reported having visions, slipped into trances, experienced great physical pleasure - and even claimed that the bugs cured their physical illnesses. Occasionally someone died; "usually by walking out into the water and never coming back." According to the missionaries, the glowing green ribbon that appeared around the island once every one hundred years represented to the Olloo’et either a path from the ancestral world to this one or the other way around, depending on how it was translated. So those who drank of the bay’s waters would either receive spectral visitors— a sort of personal haunting—or their souls would be transported to a spectral plane, which is an entirely different kind of thing. The Artemia lucis doesn't just hold a professional interest for Dr. Rachel Bell, but a personal one too. When she was six year old, her mother's boyfriend threw a pot of boiling water at her, leaving thick, painful, disfiguring scars from the back of her neck down to her waist. Her days are filled with unrelenting, chronic pain. Though painkillers take the edge off (if she's lucky), the Vicodin has already started to damage her liver and, by her count, will lead to respiratory and/or heart failure in a year. Rachel has contemplated suicide many times since the accident, but for the past two years - since she was put on the research team tasked with studying them - the Artemia lucis has been the only thing keeping her going. If only she can test their purported analgesic effect on herself. If only she can study them, keep them alive and breeding in captivity, identify and isolate the active compounds, synthesize them in a lab. Then, maybe, she could live. If only. Rachel goes rogue, as it were, pursuing her own agenda under the radar. Along the way, she pulls Harry Streatfield and his family into her scheme. Harry has a progressive neurological disease that's slowly killing him - along with an extra room that will afford Rachel more privacy with which to conduct her illicit experiments. But his ex-wife Tilda, a former state senator who's moved back in to care for him, isn't as trusting of this woman who kinda-sorta vaguely resembles their dead daughter Becca. Nor is John, a local ecologist and a descendant of the Olloo’et who joined the research project at the last minute. It's not just time Rachel is racing against as she struggles to decode the secret of the Artemia lucis - but also those wishing to protect the endangered insects (or profit from them themselves), and her own increasing paranoia and fear. The 100 Year Miracle is a surprisingly dark read: creepy, atmospheric, and increasingly manic as the Artemia lucis near the end of their cycle. Yet the most haunting aspects concern Rachel and Harry's disabilities - and the chronic, unrelenting, unspeakable pain they cause - rather than the paranoia and hallucinations caused by the insects. Both characters are made vulnerable by their illnesses and injuries - a condition they both struggle against, with varying success. Harry and Tilda's interactions are an emotionally fraught dance: Tilda tries to assist him when possible, without either of them acknowledging the reality of it. Harry looks away from his plate, and when he turns back, his shrimp have magically dissected themselves into bite-sized pieces. Harry is going to die - just as surely as the Artemia lucis - and yet it's an inevitability he cannot entertain, even as he must. There seems to be a ton of compartmentalization going on there. Likewise, the only people who know about Rachel's scars are her doctors. During her waking life, she keeps them covered - with shirts, high-necked jackets, her hair - and refuses to reveal the physical impairment they cause. Given her lack of mobility, not to mention how much pain she's in, this is a testament to Rachel's will and determination. In Harry, Rachel could find a kindred spirit and confidant: if only she were up for some personal disclosure. We see a hint of this when Harry complains about how difficult it's become for him to navigate the shower - a problem to which Rachel can relate - but, alas, she doesn't take the bait, no matter how much I wanted her to. I can't help but think that things might have turned out different, if only she'd opened up to Harry. Or found a good support group. Something. In any case, it's this - the possibility of being betrayed by your own body - that's really the scariest part of The 100 Year Miracle. Pain, whether physical or emotional (or both), is a sort of shadow MC in this story, lurking in the background but rarely, if ever, spoken of aloud. And yet: I found myself empathizing with many of the characters, even as I feared (or feared for) them. They're all complicated and flawed, but in a way that tugs at the heartstrings. Well, except for Tip and Hooper. Eff those guys. Read it if: You crave a dark, suspenseful, and weird-but-not-too-weird story. Find all of my reviews at http://ultraviolentlit.blogspot.ca! Once every century, the water around a small island in the Pacific Northwest glows green, caused by tiny sea creatures called Artemia Lucis. The miniscule arthropods complete their lifecycle in six short days, and their occurrence becomes known as “The 100 Year Miracle.” Ream’s new novel is set in the fictional Olloo’et Bay, within the actual San Juan Islands. Olloo’et Island is the traditional home of the First Nations people who shar Find all of my reviews at http://ultraviolentlit.blogspot.ca! Once every century, the water around a small island in the Pacific Northwest glows green, caused by tiny sea creatures called Artemia Lucis. The miniscule arthropods complete their lifecycle in six short days, and their occurrence becomes known as “The 100 Year Miracle.” Ream’s new novel is set in the fictional Olloo’et Bay, within the actual San Juan Islands. Olloo’et Island is the traditional home of the First Nations people who share its name – although they have mostly disappeared, those that remain feel honour and respect towards the Miracle. The scientists that have invaded the island, however, do not all come with pure intention. Rachel is one of these scientists. She has travelled to the island as part of a team of specialists, working long days and nights to study the phenomenon before it disappears again. She also has ulterior motives: struggling with chronic pain due to a childhood injury, Rachel sets up her own secret laboratory to study the creatures, seeking a miracle cure for herself and others like her. However, one of her colleagues is suspicious of her secrecy – he is an Olloo’et man named John, and his goal is to protect the island’s habitat. John’s people believe that the Artemia Lucis do have healing powers, but that they can also destroy those who consume them. Meanwhile, Henry and Tilda are a divorced couple who are once again living together in a beach house on the bay – Tilda has moved back in to care for Henry as he suffers from a fatal and debilitating disease. The couple separated partly due to the death of their young daughter, and being together in their family home again brings back many memories. When Henry sees Rachel on the beach, he transfers his fatherly feelings onto her (she is around the age his daughter would have been, had she survived). When he spontaneously offers his house to Rachel during her short stay, she agrees to move in – it will be easier to hide her secret lab if she is separated from the rest of the team. Before Henry realizes what is happening, he finds himself drawn into Rachel’s obsessive research, and the two experience the hallucinogenic side effects of the “miracle cure.” There could be a rational explanation, but according to local mythology, the Artemia Lucis is a channel for one’s deceased ancestors to pull the users to the other side. Science or supernatural – we as readers do not know for sure. In fact, I was expecting the novel to take more of a supernatural/horror turn, but instead it followed the path towards more typical thriller territory, as Rachel faces imminent discovery of her unusual research methods. I found Tilda to be the most relatable and likeable character. She gave up her political career to care for her ex-husband, despite the fact that she can’t help blaming him at least partially for their daughter’s death. While caring for Henry, she finds a new passion for sailing and a romance with a much younger man. While both burn her in the end, she develops greatly as a character, instead of getting lost in false hope like Rachel and Henry. As the novel heads towards its conclusion, situations become increasingly contrived. The supposed suspense didn’t really work for me, so the thriller aspect of the novel kind of fizzled out. What I liked more was the development of the characters, and I wish Ream had remained focused on them. I also don’t see this as fitting into the “unreliable narrator” genre, because we know Rachel’s intentions from the start. There were several unresolved issues, and the characters’ actions weren’t always realistic, but I was steadily drawn into the story and found it very entertaining. I received this novel from Flatiron Books and NetGalley in exchange for an honest review. How I Came to Read This Book: I was honestly intrigued by the fact Gillian Flynn named it a favourite. The publisher sent me a copy. The Plot: Dr. Rachel Bell is on a (fictional) island to witness a miracle - the emergence of a unique sea creature that only appears once every 100 years and has been said to have incredible healing properties. Rachel suffers from chronic pain after a childhood incident and is desperate to find a way to capture the creatures and make them reproduce, but doing so qui How I Came to Read This Book: I was honestly intrigued by the fact Gillian Flynn named it a favourite. The publisher sent me a copy. The Plot: Dr. Rachel Bell is on a (fictional) island to witness a miracle - the emergence of a unique sea creature that only appears once every 100 years and has been said to have incredible healing properties. Rachel suffers from chronic pain after a childhood incident and is desperate to find a way to capture the creatures and make them reproduce, but doing so quickly draws the scrutiny of her fellow researchers, even when she escapes through a chance encounter to live in a mansion on the beach with a dying man named Harry, and his ex-wife Tilda, who has moved in to see him through his final days. Harry and Tilda are at odds with each other at the outset, even though they have a deep bond, and things only amplify between them as Rachel's interference further boosts tensions. The Good & The Bad: I mostly didn't care for this book. It had some interesting elements - I thought Ashley Ream brought her island to life quite well - but on the whole, the story didn't make a lot of sense to me. Tilda's storyline with Tip and her boat felt wholly unrelated to what I took to be the crux of the story (or at least, what I was most interested in) - the miracle. I was definitely moreso engaged when Harry or Rachel was the focal point, although even their behaviours became increasingly erratic, which was only vaguely explained as a side effect to the painkiller Rachel is experimenting with. Rachel herself was definitely the oddest / least realistic character. Even before she starts treating herself, she seems manic; her idea of going to the island for this sole purpose and pursuing this career she's in seems bizarre, as do most of her actions. They explain her pain (although I didn't realize it would be that chronic) but they don't ever entirely explain her nuttiness. Between Rachel's insanity and Tilda not really having a huge tie to the story, that leaves us with Harry. I probably cared about him the most, but his hallucinations went on for too long and were confusingly lucid at times (see: the opera). It did add an eerie element to the story though. And I did like the sort of domino effect of the story...how if Rachel didn't resemble their daughter, she never would have been involved with Harry and Tilda, for example. All in all though, I just didn't really 'get' much from the story. I wasn't really invested in any of the characters, and when success seemed close, it all just came (literally) crashing down in a few short chapters right at the end. Based on how everything is resolved, it almost makes you feel like, "So the point of that was...?" Not a great feeling to walk away with. The Bottom Line: An interesting concept but a nonsensical execution. An intrigueing plot that went nowhere. Every 100 years, for only 6 days, the bay around a Washington island glows. Naturally scientists pull out all the stops in trying to determine what are the tiny sea creatures that cause the flow - within that 6 day window. One scientist is Rachel Bell, who has suffered since childhood with the burn scars covering much of her body. She is nearing the peak - or the end of pain medication available to her. Her scientific work deviates from her team's: she want An intrigueing plot that went nowhere. Every 100 years, for only 6 days, the bay around a Washington island glows. Naturally scientists pull out all the stops in trying to determine what are the tiny sea creatures that cause the flow - within that 6 day window. One scientist is Rachel Bell, who has suffered since childhood with the burn scars covering much of her body. She is nearing the peak - or the end of pain medication available to her. Her scientific work deviates from her team's: she wants to determine if the sea creatures can lead to a miracle cure or a pain reliever. So, she must secretly gather the creatures, discover a way to keep them alive beyond the 6 days - and experiment with different parts of the creatures to yield a magical drug. Rachel uses herself as the human test. On the island are Harry and Tilda - a separated couple. Tilda has come back to the island to take care of Harry in his final days. Could Harry be another human test for Rachel's discoveries? It seems that so much more could have been done with the story line. Harry and Tilda's son shows up - to be nothing more than a household accessory. He adds nothing to their story as a couple, parents or islanders. A fellow scientist, John, bugs Rachel with his mere appearance even though she never met him before the island trip. John talks about some spiritual voo-doo having to do with the 100 year miracle. Rachel - for some unsound reason - other than her own mental instability, is convinced that John is after her and her discovery. Tilda has a love affair with a younger neighbor- which goes nowhere. She rebuilds a sailboat; her survival against a storm at sea destroys the boat. Yet, not the love affair, the pride at fixing the boat or the horrors of almost drowning affect the development of the character. 3.5 stars. "The 100 Year Miracle" is the story of Rachel, Tilda, and Harry, three characters who come together in some very surprising ways. Every 100 years, water surrounding the area where Harry and Tilda glows green with bio luminescence. Rachel believes that she knows how to harness the power of the water in order to create life saving substance. It'll change the lives of her and those around her. This is a very original story that captivated my mind and imagination. The characters in this bo 3.5 stars. "The 100 Year Miracle" is the story of Rachel, Tilda, and Harry, three characters who come together in some very surprising ways. Every 100 years, water surrounding the area where Harry and Tilda glows green with bio luminescence. Rachel believes that she knows how to harness the power of the water in order to create life saving substance. It'll change the lives of her and those around her. This is a very original story that captivated my mind and imagination. The characters in this book fascinated. Rachel is especially fascinating. She is a scientist driven in doing something good with the glowing green water even if it means sneaking around in order to do it. I really wanted to know more about what made her tick. She is so secretive throughout the book that it was hard to really get to know her throughout the story because I felt like I was being held at arm's length. I wanted to know more about her and why she wants to do what she does throughout the book. My very favorite kind of book is one that you continue living in while and after you are finished reading it. This is one of those books. It is so sensory, so sharply vivid… frankly, I am wondering if the author has cast a spell with language that causes her reader to slip in to hallucinations along with her character, Rachel. The 100 Year Miracle doesn't need my words to dampen the spell its words cast. Get your hands on a copy as soon as possible. Things I really liked about this book: a local author, local settings--the San Juan Islands, a place I'd like to know better, that's now nearby. The plot was fascinating and unique. I love how scientifically minded many of the characters were. The thing I didn't really connect with in this book: the characters. I just didn't care about a few of them as much as I would have liked to. Slow, and not worth the struggle to finish. Spoilers. Its been quite some time since I've truly disliked a book quite as much as I do this one. I'm not sure what I missed that those who gave such glowing reviews on the book jacket clearly saw, but I found it to be incredibly hollow and honestly just disappointing. It took me two weeks to trudge through , and as a person who regularly reads one to two books per week it said something about my lack of commitment to the story and characters that I h Slow, and not worth the struggle to finish. Spoilers. Its been quite some time since I've truly disliked a book quite as much as I do this one. I'm not sure what I missed that those who gave such glowing reviews on the book jacket clearly saw, but I found it to be incredibly hollow and honestly just disappointing. It took me two weeks to trudge through , and as a person who regularly reads one to two books per week it said something about my lack of commitment to the story and characters that I had to convince myself it was time to pick up again as if I were working on a particularly dull term paper rather than enjoying a novel for funsies. I had initially been quite excited to dig in, the brief description seemed like something I would really enjoy for several reasons: I particularly enjoy stories that combine science or science fiction with realistic locations and believable premises. I love political mysteries and intrigue. I am a sucker for a good romance, and if it's one made of rekindled connection in the face of impending tragedy, bonus points. Finally, on a personal level, I am a person who suffers from a debilitating disease that causes me to live with chronic widespread pain, and also come from a family with a high prevalence of ALS, MS, and similar conditions well known for causing symptoms very much like those Harry suffers from in the story. That said, I thought for a moment prior to beginning the book that I may have just stumbled upon my perfect novel! I was very quickly let down. Rachel was not at all a fully fleshed out character. There was zero heart, and her actions and interactions did not make sense when compared to her description as a very intelligent young woman. Even a person completely lacking in social graces wouldn't lack the wherewithal to intelligently deal with a situation such a s described between she and John early on in the book. As someone described as a respected member of her scientific team, albeit perhaps unpopular, as well as her directors pet, there is no logical reason she would not have just gone to Hooper from the get go to ask about John and inform him that John had been seemingly trying to invade her personal cabin and intimidating her and could they please just keep an eye out, etc. Instead she was drawn as a jealous child incapable of rational thought, who stupidly set herself up for blackmail rather than just dealing with a bully. And, at that, any scientist worth their salt would have put in for research funding based on their studies of their subject which may not necessarily match others level of understanding. Had she not been given clearance for funding, I can't think of a single logical reason that a team of apparently world renowned scientists would have barred her from studying a branch topic on her own time. The whole premise is just ridiculous. John. He is cast as this big brute of a bully who is supposedly a scientist though were given no back story regarding how Hooper just happens upon him conveniently right as he's leaving for a study in the territory of Johns heritage. How did he get his foot in the door? How did he somehow just "know" what Rachel was doing? If it truly had been an issue of a colleague breaking protocol, why the secrecy and intimidation tactics? And at the end, how did he somehow know that Rachel had ODd and why was he suddenly the hero? Soooo much more could have been done with his aspect of the story. Harry. Of all of them his was the most believable and likeable, but again there is no follow through. Tilda was portrayed as this icy yet needy wench, there's hope for something interesting with her a few times but inevitability all the moments that could have pulled through into a real and fully developed story are just left hanging and half finished. There are a few other menial characters who truly should've just been scrapped on the editing table, and by the end of the novel I was left wondering if perhaps my copy of the eBook didn't fully download, because there MUST be more to it than this, right? The whole book was essentially a drawn out first three chapters wherein we meet the characters and learn the storyline and eventually move on to the good meaty stuff, except that we never make it to the good meaty stuff. And its topped off with an ending that was clear!y intended to be some sort of cerebral thinking mans cliffhanger where we are left to ponder and argue whodunnit, it the problem is, the while thing was so stingy and boring that if one actually manages to slog through to this clever twist, they haven't been given any reason to be invested enough to actually care. Ashley Ream's The 100 Year Miracle is about three people trying to figure out how to save themselves from their past. You start off with Rachel. Rachel is a very intelligent scientist, but that is one of the reasons why she has only a few friends and no family. On top of all this, she is hiding a secret from everyone who tries to get near her. A secret that could affect those people if they were to get close to her. Next is Tilda. She is going back to her home to take care of her ailing ex-husband Ashley Ream's The 100 Year Miracle is about three people trying to figure out how to save themselves from their past. Next is Tilda. She is going back to her home to take care of her ailing ex-husband. She also had no other choice but to go home because she lost her job and has no idea what she is going to do for the rest of her life. Finally, there is Harry, who is Tilda's ex. Harry was a composer who cannot live by himself anymore because he is dying. His last hope is to fix things with Tilda after a hardship happened to them when they were in the beginning stages of their marriage. All he wants to do in his last months is fix what is broken between them. All three of them are living on a coastal island, and each of them is in need of alleviating their pain. Tilda is searching for a new start, but while she is doing that she starts to figure out Rachel and the secrets that Rachel is keeping. Tilda is also dealing with the fact that her husband is dying. There is a lot going on for them, but all they want to do is save themselves. "It was the very end of the very last day of the breeding, a thing that would not occur again for another century. It was so rare and so wondrous that comets and meteor strikes seemed workaday by comparison. Newspapers and television reporters had taken to calling it the 100-Year Miracle. It did things to people, this miracle. Strange and not wholly wonderful things." This book was beautifully told and written. Ream does an excellent job of having the reader be emotionally invested in each character. Harry was the most heartbreaking because he knew his death was coming, but he planned on making the most of it by reconnecting with Tilda. I recommend this novel to anyone who is looking for a compelling story that you will want to recommend to all of your friends. The plot revolves around an event that happens once every hundred years. For six nights a bay on a small island glows, tiny creatures giving off light. The event has been a part of native lore, passed down from generation to generation. Researchers descend on th I was excited to read this novel chosen as the Whidbey Reads for 2017. While the novel takes place on a fictional island in the San Juans, the author notes that she borrowed heavily from Whidbey Island of which I am a resident and native. Wow! What a great premise. I loved the idea that this exotic (albeit fictional) phenomenon could happen on an island off the coast of the US. The book had mystery, a really different protagonist -- a former woman senator. I liked the fact that she moved back to help take care of her ex husband when he became too ill to care for himself. I liked the supernatural element, which did not become goofy and seemed plausible in this instance. A good read. To the author: as far as I know, phenomenon is st Wow! What a great premise. I loved the idea that this exotic (albeit fictional) phenomenon could happen on an island off the coast of the US. The book had mystery, a really different protagonist -- a former woman senator. I liked the fact that she moved back to help take care of her ex husband when he became too ill to care for himself. I liked the supernatural element, which did not become goofy and seemed plausible in this instance. A good read. I wanted to love this book, because I truly loved "Losing Clementine," but it ended up being a slow read for me. I found the story idea fascinating and the characters sympathetic at the outset. The pacing began to lag at the halfway point, though, and I skimmed the last 75 pages to what seemed a patched together ending. A little disappointing, because Ream is an accomplished writer, but not disappointing enough to keep me from reading her next book. I've read a lot of reviews of people who didn't like this book because they didn't like any of the characters. I agree, they aren't particularly likeable, some of them are downright annoying. But is this a reason to dislike a book? Or is it a reason to admire a writer who is clever and careful enough to deliberately construct memorable characters who do wacky things. In the context of the story, paranoia and escalating insanity fits well. How else could it be? It was never going to end well. I was liking it pretty well, interesting pretext, forgiving some trite phrases now and then. The end was really disappointing, though. Felt hollow and contrived, covered with too few details, rushed to conclusion. I also felt the John character could have been much more developed.